What can go wrong? Also there won’t be any April Fool’s shenanigans on this blog, so don’t get too excited. Anyway these two photos catalogue my recent trip to my local gaming store. I bought a total of 11 minis (although 2 of them are gifts), all of which are for Dinosaur Cowboys. 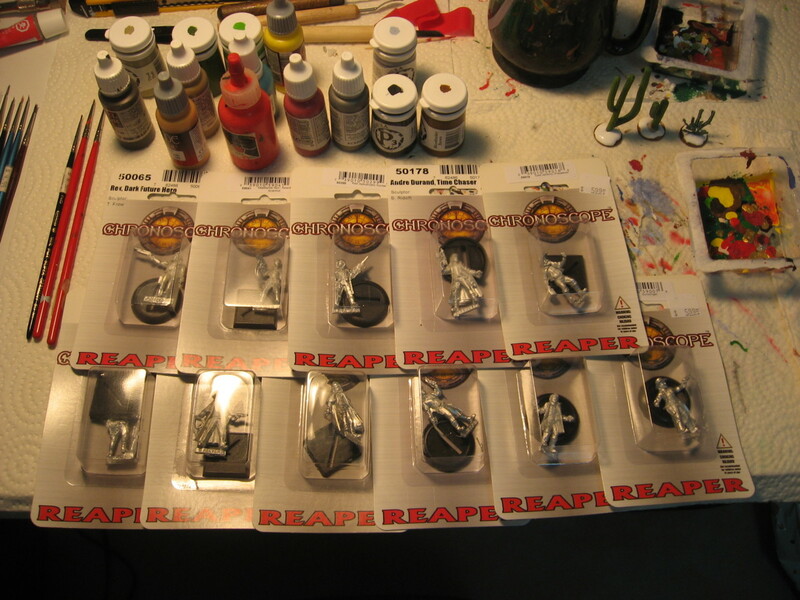 They are also all from the terrific Reaper Mini Chronoscope line, which are inexpensive minis of various genres. They do a great job of copying popular culture and switching the names to get around trademark issues. For example Rudd Starslider, Space Smuggler who is very clearly Peter Quill aka Star-Lord from the recent Guardians of the Galaxy movie. Similarly Rex, Dark Future Hero who is Mad Max, right down to the torn sleeve (they even get a nice little nod to Game Workshop’s early road warrior style game Dark Future). But I’m not complaining, merely highlighting the awesome range you can buy. I’m going to base everyone up, fill in the gaps with puddy, base coat them all, and then have 9 minis lined up to paint whenever I feel like it. 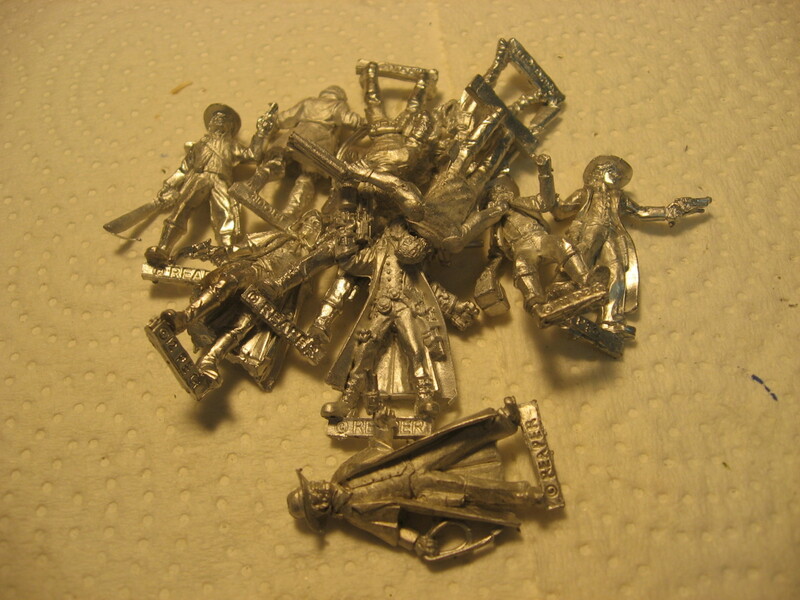 Otherwise I have probably ~15 more in a “paint for DC” box, collected from Ebay and various other sources. One day soon I mean to take a photo of all the minis I need to paint, and also all the minis for Dinosaur Cowboys I have painted. This is a big purchase for me since after all I’ve probably bought an average of one mini per ~3 months for the past 5 years. My motivation is simply to get some specific DC minis based and undercoated so I can just sit down and paint them. I want to get back into painting a bit, since rank-and-file troops of mass battle games (specifically Warhammer 40,000) turned me off the hobby for a while. Basically childhood burnout that bled into losing focus on painting in adulthood. To me painting single minis like this is the peak fun-ness of the hobby. You can vary the paint scheme mini to mini, add a lot of characterization and uniqueness to each, and the look changes drastically between minis. Since I started Dinosaur Cowboys I actually haven’t done too badly with painting new minis. I probably added close to 10 to my collection. So with luck in the next year or so I’ll have another 20 done!